Ever since I was a teenager I’ve exercised and tried to eat healthy most of the time. I’ve never been willing to give up anything completely because brownies, ice cream, and nachos are my favorite foods– a life without them would be a life without air. When I got pregnant with my first child, I had visions of zipping up my pre-pregnancy jeans as we were leaving the hospital as it seemed that’s what all the ladies in Hollywood did. I was the first of my friends and family to have a child and really didn’t have anything to go on. Clearly I should have known better than to think I had genes, a trainer, and a personal chef like these leading ladies did. I tried to keep my weight within the 30-35 pounds recommendation and did pretty good the first trimester; I only gained two pounds and I remember stepping off the scale thinking, This is going to be a piece of cake and I bet I won’t even gain the full thirty pounds! I totally have this. But soon the nausea wore off and the child cooking in my stomach seemed to have a reaction every time I ate fruit, a vegetable, or anything else healthy like yogurt or God forbid some type of puffed rice snack. That child wanted something a bit more filling–like a cheeseburger, large fry, and a box of fried chicken– or I would feel like my stomach was eating itself. I was a new sensation for me, and I tried to stay strong for exactly two days by eating salads with boiled chicken the size of a bird bath, 2- pound bags of carrots, and enough apples and bands to feed an elephant. But alas, it did not work. I wanted grease, salt, carbs, sugar, and bacon draped all over everything. I had fantasies about eating an entire container of frosting with a side of Doritos. I wanted to keep containers of Easy Cheese and a sleeve of Ritz crackers in my purse at all times. I wanted to be reckless with my food choices despite all the warnings about not gaining too much weight and the importance of trying to stay healthy during this delicate time. But I gave in one day while I was at the grocery store, wearing a pair of maternity jeans for the first time that kept sliding down my hips. I grabbed a hold of a bag a milk chocolate chips and busted them open right in the middle of the baking aisle. Time stood still as I shoved them in my mouth, I don’t think I moved for a good five minutes. I just tried to make it look like I was reading the recipe for cookies on the back of the bag, when in reality, I was planning a trip down the chip aisle next. I never went back after that day. For the rest of my pregnancy, I gave into every craving. My husband would fetch me a blizzard from Dairy Queen every single night. I ate an entire block of cream cheese over 4 bagels in one sitting, and would have my way with the Chinese Buffet on the regular. Those jeans that were sliding down my hips didn’t fit me until 6- months after my baby was born. I’d gained over 50 pounds and I really didn’t care, it was worth every calorie, every binge, every late night guzzling down chocolate milk out of the container. My appetite went back to normal after I had my baby, despite the fact he breastfed all the time, and eventually, the weight came off in time for me to get pregnant a second time (and have my enormous appetite come back with a vengeance). Only this time, I didn’t waste my time trying to fight it. 55 pounds and one beautiful daughter later, I realized my body just needs different things when I was pregnant than it does when I’m not. There was no point in trying to be something I wasn’t. 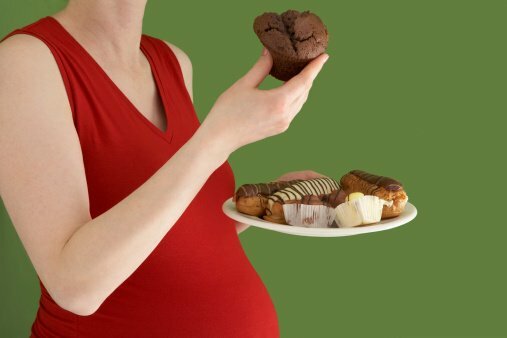 When pregnant, I’m a food- whore, ok? I repeated the cycle again when I got pregnant with number three, only this time, I didn’t get spoiled with that nauseous first trimester that saved a few (or twenty) pounds. This guy wanted food right away and by the time he was crowning I had added 75 pounds to my frame and loved every second of it. The point I’m trying to make is pregnancy is a time to indulge– if you want it, eat it. Don’t hold back (unless instructed by your doctor of course). I was fine, my kids were fine, and eventually, years later, I lost the baby weight. Truth be told I miss the days of growing a child and eating copious amounts of peanut butter cups, but I had my glory days– three times over– and damn, they were fun.